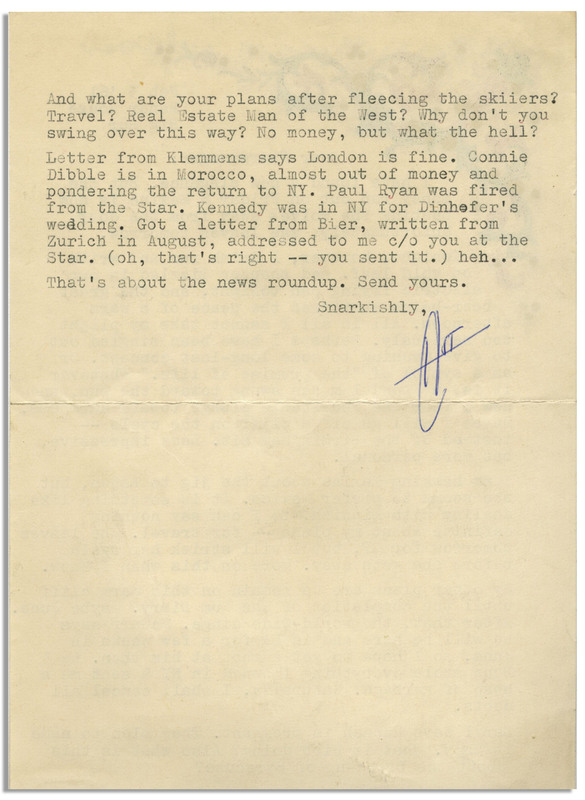 Hunter S. Thompson letter signed ''HST'', with visceral, vague content on his finances and state of mind. 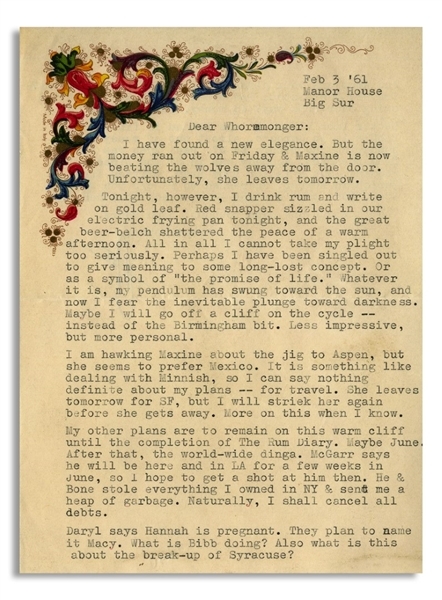 Composed 3 February 1961 from ''Manor House'' in Big Sur, Thompson writes to his friend Paul Semonin, referring to the ''Birmingham bit'', his suicide plan to drive off a cliff in a car filled with dynamite. 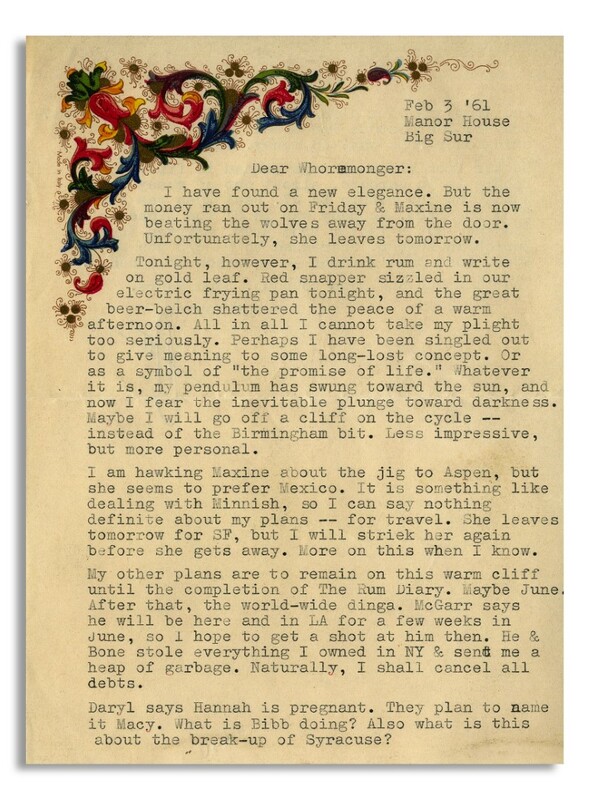 Letter reads in part, ''Dear Whoremonger: I have found a new elegance. But the money ran out on Friday & Maxine [Ambus] is beating the wolves away from the door...Tonight, however, I drink rum and write on gold leaf...Perhaps I have been singled out to give meaning to some long-lost concept. Or as a symbol of 'the promise of life.' Whatever it is, my pendulum has swung toward the sun, and now I fear the inevitable plunge toward darkness. Maybe I will go off a cliff on the cycle -- instead of the Birmingham bit. Less impressive, but more personal...My other plans are to remain on this warm cliff until the completion of The Rum Diary. Maybe June. 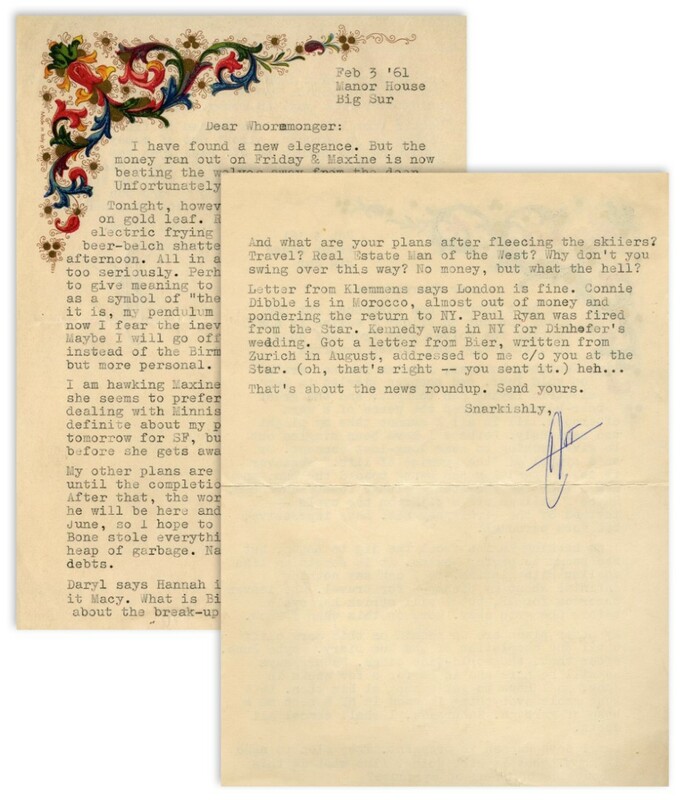 After that, the world-wide dinga...And what are your plans after fleecing the skiiers?...Snarkishly, [signed] HST''. Two page letter on a single sheet of Italian stationery measures 5.75'' x 7.75''. Fold, touching bottom of signature, else near fine.